Br. Ignatius (S. Innasimuthu) was born of Swamiyadiyan and Snehappu at Vellikode on 29th August 1927 in the diocese of Kottar. He made his first profession in our Order on 19th March, 1955. Br. Ignatius made his ecclesiastical studies in Belgium and was ordained Deacon. Owing to his ill health priestly ordination was postponed. He returned to the Province and joined the community of St.Teresa’s Monastery, Ernakulam. On 14th of September 1963 Br. Ignatius, fortified with holy Sacrament of the Church slept in the Lord. His body was taken to our monastery at Varapuzha in the evening and was buried in our Monastery Church at about 9.00 p.m. on the same day. Fr. Joseph of St. Mary slept in the Lord on 10th of June, 1968 at the age of 66 and 39th year of his profession. Brother Joseph of Mary Immaculate slept in the Lord on 16th June 1969, at the age of 17. Br. Romaeus slept in the Lord on 21st August, 1969 at the age of 65 and 38th year of profession. Fr. John of the Cross slept in the Lord on 10th May, 1972, aged 62, professed 41. Fr. Philip (Joseph Kaipanplackal), Son of Joseph and Teresa, was born at Kozhuvanal in the diocese of Changanacherry (now Palai) on 31st March, 1909. Fr. Eliseus (John Malamakkal), Son of Thomas an Anna, was born at Elikulam in the diocese of Changanacherry (now Kanjirapally) on 15th September, 1904. Fr. Paul of Jesus expired on 21st April 1984 at the age of 67 and in the 47th years of his religious profession. Fr. Archangel of the Queen of Carmel, Prior of Carmelite Monastery, Thuckalay, TamilNadu Delegation, expired on 26th of May 1985 at the age of 73 and in the 51st year of his religious profession. Fr. Alphonse of the Mother of God, conventual of Cherupushpa Ashram, Ettumanoor, expired on 5th June 1987 in Bombay at the age of 68 and in 48th year of his religious profession. Fr. Dionysius of Nativity, conventual of Carmel Hill Monastery, Trivandrum, expired on 6th November 1987, at the age of 80 and in the 58th year of his religious profession. Memorial Hospital for treatment and there he received the last sacraments. As his health condition improved, he was brought to Carmel Hill. However his condition deteriorated in the last week of April and on 25th April at 8.15 a.m., in the presence of Fr. Provincial, Prior and some students, he breathed his last. His funeral was conducted at Carmel Hill, Trivandrum, on the following day (26th of April). The funeral service was begun at 9.00 a.m with concelebrated Mass presided over by the Provincial. A good number of Parishners, religious and laity attended the service. Fr. Bernardine Vallathara preached the homily during the Mass. With the demise of Bro. Francis, a certain fall on the first generation of Malabar Province. However, his simplicity, dedication to work, Spirit of Prayer will continue to inspire many. Rev. Fr. Job (Kunjio Edasserry) son of Ouseph Edasserry and Kathereena Chittilappilly was born on 5th September, 1953 at Edakkunnu, in the Archdiocese of Ernakulam. He joined our Apostolic school at Ernakulam in 1967. He joined our order at Cherupushpa Ashram, Ettumanoor on 3rd June 1970 and did one year postulancy there. He had his second year postulancy at Carmel Hill Monastery, Trivandrum. He received the holy habit of the order on 23rd April 1972 at Thuckalay, TamilNadu. After completing one year Canonical Novitiate at Thuckalay, he made his First Profession on April 24th ,1973. On September 15, 1973, he returned to Carmel Hill Monastery, Trivandrum for his Philosophical studies. He was there till 1979 and on January 7, 1979 he made his solemn profession at our St. Teresa’s Monastery, Ernakulam. Fr. Job Edasserry did his Theology course at Teresianum, Rome from 1979 onwards. He was ordained priest in Rome on 6th June 1982 by his Holiness Pope John Paul II. Bro. Felix (Cruz Rajappan), Son of D. Cruz, and M. Vaihamma was born on 25th January 1915, at Kalkurichi, in the diocese of Kottar, Tamilnadu. He joined our order at Carmel Hill Monastery, Trivandrum on 1st June 1939. After six months of postulancy he received the holy habit of the order on 18th January 1940, and made his First Profession on 19th January 1942, at Carmel Hill Monastery, Trivandrum. Bro. Felix made his Solemn Profession on February 23rd 1945 at Carmel Hill, Trivandrum. In February 1992, Bro. Felix celebrated the Golden Jubilee of his profession, at Carmel Ashram, Kalady. Bro. Felix was conventual in our Monasteries at Trivandrum, Thuckalay, Ernakulam, Bangalore, Ettumanoor and Kalady. From May 1989 until his sudden demise in 1995 he was a conventual of our novitiate house at Kalady. Bro. Felix was very earnest and dedicated in the discharge of his duties assigned to him in our different communities. Memorable and praise worthy were his simplicity of life and spirit of poverty. Though an octogenarian, Bro. Felix has no serious ailments and maintained good health until the last. On 19th evening by 10.00 p.m he complained of a sudden chest pain and he was rushed to the nearby hospital Little Flower, Angamaly where he died of heart attack at 1.00 a.m in the Monastery Crypt of Carmel Hill, Trivandrum. Rev. Fr. Joseph Mary Kuruvinapakuthiyil was the main celebrant of the funeral mass and Fr. Zacharias Kariyilakulam gave the funeral oration. His Excellency Dr. M. Soosa Pakiam officiated the funeral rites. A good number of priests, religious and laity participated in the funeral ceremony. Fr. Michael, son of Varkey Kalleplackal and Aley, was born on 23rd February 1963 at Arakkulam in the diocese of Palai. He joined our order at Avilagiri Ashram, Koombara on 11th June 1983 and did one year postulancy there. After the pre-novitiate course he received the Holy Habit of the order on 7th September, 1984 at Carmel Ashram, Kalady. Having successfully completed one year of canonical novitiate then he made his First Profession on 8th September 1985. He was sent to our Carmel Hill Monastery, Trivandrum for his philosophical studies, in 1986 and was there till 1989. Mean while he also graduated in Arts. After completing his philosophy course he did one year of regency in our Malabar Carmelite Mission, Punjab. After his regency, in 1990, Fr. Michael went to our Carmelaram Theology College, Bangalore to do his theology, on June 2nd , 1991 he made is Solemn Profession at Cherupushpa Ashram, Ettumanoor and he was ordained priest on November 19th, 1993 by his Excellency, Mar. Joseph Pallickaparambil, the Bishop of Palai, in his parish church at Arakkulam. Fr. Michael was conventual of Carmel Ashram, Kalady from December 1993 to May 1994 . In May 1994, he was transferred to St. Teresa’s Monastery, Ernakulam and was conventual there till December 1995. In December 1995, he was transferred to Carmel Hill Monastery, Trivandrum and was conventual there until his demise in April 1996. Fr. Michael was very devout and exemplary religious. His simplicity of life, spirit of poverty, availability to community and readiness to do any kind of service for the good of his community in spite of his ill health and fatal sickness deserve special appreciation. Fr. Michael was under medication ever since the diagnosis of his illness. But he participated in all the community acts and did his priestly ministry in such an extraordinary way that nobody could ever understand that he is in such a critical stage. Fr. Michael was admitted in the Jubilee Memorial Hospital, Trivandrum, during the last three months of his life, and blood transfusion was done regularly. What deserves to be specially mentioned is that even when he was writing in excruciating pain, he never complained of his suffering. He offered his suffering for the conversion of the sinners, growth and development of our missions, and for the welfare of our Malabar province. His bystanders have reported hearing him offering his sufferings for the above intensions when he was in coma. On the 25th of April, 1996 Fr. Michael’s condition became very critical still he requested for and received Holy Communion. On 26th Friday afternoon his condition further deteriorated and sharp at 4.30 p.m. Fr. Michael breathed his last at the young age of 33. His funeral took place on the following day at 3.00 p.m and his mortal remains were interred into the Monastery Crypt of Carmel Hill, Trivandrum at 4.30 p.m. His Grace Cyril Mar Beselius, Archbishop of Trivandrum prayed the office of the dead, visiting the dead body and His Excellency Rt. Rev. Dr. M. Soosa Pakiam, Bishop of Trivandrum officiated at the last ceremonies of the funeral rites. A large number of religious and priests and laity attended the funeral ceremonies. Fr. Herman was born on 11th January 1910, of the noble family of Nodimackal at Edamattam in the diocese of Palai. He had his school studies at St. Thomas School, Palai and in 1931 he joined our order at Carmel Hill Monastery, Trivandrum. After his canonical novitiate he made his first profession on 24th June, 1932. Having successfully completed his philosophical and theological studies, he wad ordained priest on 20th March 1944 at Thuckalay. Fr. Herman was conventual in our Monasteries at Verapoly, Ernakulam, Thuckalay and Trivandrum. He served the province in various capacities as Librarian, House Councilor, etc. He had been parish priest in many parishes and mission stations of Trivandrum diocese. The immortal service Fr. Herman has rendered to our order, church, and world as a literary figure, will be remembered all through the ages. He is well-known poet, translator and a linguistic scholar. He has translated the world famous poems of Christian and Carmelite mystics into Malayalam. The Malayalam translations of the poem “Hound of Heaven and poems of Little Flower” are the best example of his poetic genera. The yeomen service of Fr. Herman in the field of christian literature is the translation of the works of our Holy parents, St. Teresa of Avila, St. John of the cross and Autobiography of Little Flower from the original language to the Malayalam. He learned Spanish, French and Italian by himself and also he was well-versed in English, Latin and Tamil. The important translation are Ascent of Mount Carmel, Dark Night, Spiritual Canticle, The Living Flame of Love, minor works, way of perfection, Interior Castle, The Story of a Soul, Poems of Little Flower, and Hound of Heaven. In 1982 Fr. Herman celebrated the Golden Jubilee of his profession and on 20th March, 1994, he celebrated the Golden Jubilee of his Priestly Ordination. From 1990 onwards, Fr. Herman was taking rest due to old age. In 1994 he was bed ridden and had memory failures. Many a time he was admitted in the hospital for various ailments due to advance age. Strengthened by the Sacrament of the Holy Viaticum Fr. Herman slept in Lord on 7th November, 1996. Most. Rev. Cyril Mar Baselius, the Archbishop of Trivandrum and Rt. Rev. Dr. Vincent Samuel, the Bishop of Neyyattinkara said office of the Dead for Fr. Herman. The funeral service of Fr. Herman took place on 9th November at 10.15 am. Fr. Augustine Valummel OCD, the second councilor was the main celebrant of the concelebrated Holy Mass. Fr. Bernardine Vallathara OCD gave funeral oration. Rt. Rev. Dr. Soosa Pakiam was the main celebrant of the last rites. Relatives of Fr. Herman, friends, and well wishers of Fr. Herman attended the funeral service. Bro. Placid (V.J. Varkey), Son of Job Vallippalam and Rose Kanyalapuzha, was born on 15th March 1922, at Monippally (Kurianad Parish) in the diocese of Palai and was baptized on 19th of March, 1922. On 1st June 1942 at the age of 20, he joined the order as an aspirant at Carmel Hill Monastery, Trivandrum. After canonical postulancy he received the habit of the order and began his novitiate on 20th July, 1942, at Carmel Hill Monastery and made his first profession on 22nd February, 1946. Bro Placid made his solemn profession on 11th April, 1948 at Carmel Hill Monastery, Trivandrum. Bro. Placid was conventual in our Monasteries at Carmel Hill, Trivandrum, St. Elias Monastery, Thuckalay, St. Teresa’s Monastery, Ernakulam and Carmelaram, Bangalore. He served our communities in the various responsibilities assigned to him. He was in charge of Sacristy, Garden and cultivation in many of our communities. Since, 1961, he was the supervisor of our St. Joseph’s press and San Joe process. The yeomen service he has done to our press and process for its growth and development will be written in golden letters in the history of the press. Bro. Placid was very diligent in the discharge of duties assigned to him and was always serviceable to the community and people out side. His unassuming way of life, simplicity, availability to the community, and his commitment to the duties, must be a source of inspiration to all of us. He was a model religious to our young ones. In February, 1996, Bro. Placid celebrated his Golden Jubilee of his religious profession. In June 1996, due to his ill health, he retired from all responsibilities and was taking rest at Carmel Hill Monastery. Since few years he was suffering from Parkinson and many a times he was admitted in the Hospital. As his health was degrading day by day, on 12th May, 1997, he received the sacrament of the anointing of the sick in the presence of the community by Fr. Provincial. On 21st May, 1997 at 10.00 a.m Bro. Placid breathed his last at the age of 75. His funeral took place at 2.30 p.m on 22nd May 1997. Fr. Provincial, Rev. Fr. Martin Pananthanam, was the main celebrant of the funeral mass and Fr. Bernardine Vallathara OCD gave the funeral oration. Rt. Rev. Dr. Soosa Pakiam, the Bishop of Trivandrum was the main celebrant of the last rites. Relatives, representatives from our houses, and religious Institutions, staff and workers of our press and process and a good number of laity were present at the funeral service. The mortal remains laid to rest at 5.00 p.m in the Monastery Crypt. Our beloved Fr. Lucas Chilambassery of the Child Jesus OCD expired on 16th November, 1997 at the age of 72 and in the 49th year of his Religious profession. Fr. Lucas (Job Paul Chilampacherry) was born on 3rd October 1925 at Monippally, Kakkoor parish in the diocese of Palai as the second of the three sons to Mani Paily Chilampacherry and an Anna Vallipalam and was baptized on 10th October 1925. At the age of 21, on 8th May 1946 he joined our order as a postulant at our Carmel Hill Monastery, Trivandrum. He received the habit of the order and began his novitiate on 5th August 1947 at St. Elias Mount, Thuckalay, TamilNadu, and made his first profession on 6th August 1948. On 6th August 1951 he made his solemn profession at Carmel Hill Monastery, Trivandrum. He successfully completed his Philosophy and Theology courses at Carmel Hill Monastery, and was ordained Deacon on 18th September 1954 and priest on 24th March, 1955 at Carmel Hill, by His Excellency Rt. Rev. Vincent Derere OCD, Bishop of Trivandrum diocese. The high esteem Malabar Province always had for Fr. Lucas is clear from the very fact that he held very important and responsible offices in the province for 32 continuous years until he himself decided not to accept any offices whatever. He was provincial procurator and Director of postulants for one year each. He was the Master of the Novices for as many as 12 years from 1963 -69 and from 1975-1981. Fr. Lucas was Provincial Councilor in charge of spirituality from 1981-84. He was prior at St. Elias Monastery, Thuckalay, Carmel Hill Monastery, Trivandrum and Carmel Ashram, Kalady. Fr. Lucas was superior at Cherupushpa Ashram, Ettumanoor for 6 years. He was conventual and spiritual father of our Aspirants at Avilagiri Ashram, Koombara, when so sadly and suddenly he died of a heart-attack on 16th November 1997. The wonderful service Fr. Lucas has rendered to Malabar Province, particularly in the field of formation would ever be gratefully remembered by everyone in the province. His life was his example. His simplicity, prayerfulness, love for his community and religious order and above all his devotion to his duties and responsibilities were always inspiring. He was like a father who understands and cares about his children. He always had a welcoming smile on his face. He was well-known for his love and compassion for the poor. He always had a special concern for them and was always ready to do for them whatever services possible. He has also served many religious congregations in his capacity as spiritual director and confessor. Fr. Lucas did not have any serious illness. On Friday, 14th November he complained for a minor chest-pain and went to nearby hospital to consult the doctor. The doctors, however, diagnosed symptoms of a heart attack and admitted him in I.C.U. They did not see anything critical. Fr. Lucas was talking to fathers and brothers who were at his beside. In the afternoon of Sunday 16th November, Fr. Lucas expressed his desire to celebrate the Holy Mass and requested Fr. Superior to make necessary arrangements for that. However by 15.30 hrs there was sudden change in his condition and Fr. Lucas became unconscious all on a sudden. He was administered the Sacrament of the Anointing of the Sick and Fr. Lucas breathed his last at 15.45 hrs. His body was taken to Avilagiri Ashram, where he was conventual at the time of death. From there it was brought to Carmel Hill, Trivandrum. On the following day via his home at Thirumarady which has turned to be parish church (both his brothers being priests, elder brother, Fr. Mathew Chilampacherry, is a member of the Malabar Province and younger brother, Fr. Paul Xavier is the Rector of the Minor Seminary of the Diocese of Kozhikode, then home and property were handed over to the diocese of Palai on condition that it be converted a parish church, Lisieux Centre, Muvattupuzha and Cherupushpa Ashram, Ettumanoor. The funeral service started at 15.00 hrs on 17th November 1997. Rev. Fr. Martin Pananthanam, Provincial was the main celebrant of the funeral Mass and Fr. Peter Chakiath delivered the funeral oration. His Grace, Most. Rev. Cyril Mar Baselios, Arch-Bishop of Trivandrum came in to pay his last respects and prayed for the repose of the Soul of Fr. Lucas. His Excellency, Rt. Rev. Dr. Soosa Pakiam, Bishop of Trivandrum officiated at the last rites. An unusually large number of priests and religious besides his relatives took part in the funeral services. The mortal remains were interred into the Monastery Crypt by 17.30 hrs. May the merciful Lord grant him the heavenly reward prepared for his chosen ones and may his soul rest in peace. Rev. Fr. Berthold, son of Esthappan and Thresia was born on the 28th of September 1913 at Neeranthanam near Ramapuram in the diocese of Palai. After having completed his high school studies at Kuravilangad, he joined our order at Carmel Hill Monastery, Trivandrum on 12th July 1935. After a year of Postulancy at Carmel Hill Monastery, he received the Habit of the Order on the 7th of July 1936 and he made his First Profession on the 8th of July 1937; his solemn profession was on the 8th of July 1940, both at Carmel Hill and theological studies at Thuckalay (Tamilnadu). He was ordained a Priest on the 14th of April 1945 at Thuckalay. Fr. Berthold was conventual in our monasteries at Trivandrum, Ernakulam, Varapuzha, Muvattupuzha, Koombara, Sengulam and Kalady. He was entrusted with various responsibilities in the province: viz. vocation promoter, Director of Postulants, Professor of Social Science, Superior and Assistant Provincial Procurator. As a religious, he loved the Province and the Order very much and strenuously endeavored for its growth by promoting many good vocations to it. Right from the very beginning of his priesthood till his last days on earth he was an ardent promoter of the ‘Scapular Devotion’, carrying them always in his pocket for free distribution. He was instrumental to the Foundations at Koombara, Peravoor and Sengulam. Fr. Berthold considered priesthood as the greatest gift he received from the Lord. Therefore, he committed himself totally to the service of the Lord and His church by being available to whoever calls on him. He traveled far and wide in Kerala rendering his services to parishes, mostly in Malabar and High ranges. He had a vast company of priests as his personal friends, which in turn enabled him to get good candidates to the Province. There are certain distinguishing characteristics for his personality, such as an ever smiling face, a welcoming attitude, prayerful and recollected, generous and humorous; a man without any complaint, with a heart full of love for all! Fr. Berthold was fortunate enough to spend his last years on earth in the calm and prayerful atmosphere of the Novitiate House at Kalady. His presence in the House was an inspiration to everyone in the community, especially to the Novices. For about two years he was confined to the House and eventually to his cell with various infirmities that are concomitant of senility. He endured every suffering and inconvenience with admirable patience. He was admitted to San Joe Hospital at Perumbavoor on the 30th of March 2000, with gastric problems and a severe pain in both his ears. Consequently he had difficulty to talk and to take even light food. He had a severe cardiac arrest on the second day in the hospital. Therefore he was rushed to the ICU. After two days in the ICU, he was taken back to his room where his condition seemed quite deteriorating day by day. The attempt of doctors for nasal feeding also was in vain. Our community kept round the clock watch and followed him with prayerful support till his last breath at 01.30 p.m. on the 10th of April, 2000. The body was brought to our Monastery at Kalady by 03.30 p.m. and was removed to the chapel at 06.00 p.m. for the public to pay homage. The community kept vigil throughout the night. On Tuesday 11th April at 08.10 a.m. Mar Thomas Chakiath, Auxiliary Bishop of Ernakulam conducted the first part of the Funeral service in our chapel and the body was taken to the Lisieux Centre, Muvattupuzha at 09.30 a.m. The funeral mass at Lisieux Centre started at 02.30 p.m. with Very Rev. Fr. Augustine Valummel, Provincial, as the Principal Celebrant and a good number of Priests as concelebrants. The last part of the funeral service was officiated by Mar George Valiyamattom, Archbishop of Thalassery. The deceased was laid to rest in the crypt of Muvattupuzha at 04.30 p.m. in the presence of a good number of priests, religious and laity. The Malabar Province will ever remember Fr. Berthold as an authentic Carmelite who loved her and served her till the end. The diocesan priests will remember him for the services he rendered in numerous parishes. Innumerable people will remember him for his blessings and ‘healing touch’ always with a smile. Indeed, he was a man of God who lived among men and gone home to God!! ! !MAY HIS SOUL REST IN PEACE !! Our Dear Fr. Brocard who was to celebrate his 81st birthday on the 11th of September 2001, expired on the 31st of August when the whole of Kerala was celebrating Thiruonam. He had been suffering from old age ailments for sometimes. His physical condition became worse when he sustained a massive heart attack a few months ago. After that he was bed-ridden. The community of Carmel Hill was preparing to celebrate his Patron’s Day, which falls on the 2nd of September, when he flew to Heaven to celebrate the feast of St. Brocard to whom the Carmelite Rule was given by St. Albert of Jerusalem. When the death of Fr. Brocard was announced, people from all walks of life flocked to our Monastery to pay their respect, among whom were, His Grace Cyril Mar Baselious, the Metropolitan Archbishop of Trivandrum, His Excellency Rt. Rev. Dr. Soosai Pakiam, the Bishop of Trivandrum, His Excellency Joshwa Mar Ignatios, the Auxiliary Bishop of Trivandum Arch Diocese. The community of Carmel Hill celebrated a Requiem High Mass officiated by Rev.Fr. Provincial in our Auditorium where the body of Fr. Brocard was kept in the mobile mortuary. Rev. Fr. Bernadine Vallathara, the Prior of Carmel Hill, who knew Fr. Brocard from the year 1940 gave the homily, bringing out the special virtues for which Fr. Brocard was an example for everyone. His body was taken to Lisieux Centre, Muvattupuzha from here at 01.00 a.m. on the 1st of Septemeber. Rev. Fr. Provincial and many of the members of Carmel Hill Community accompanied to Lisieux Centre. Rev. Fr. Provincial officiated the Holy Mass at Lisieux Centre at 10.00 a.m. His Excellency Mar George Punnakkottil officiated at the funeral rite. His mortal remains were interred into the crypt at Lisieux Centre at 12.30 p.m.
Rev. Fr. Brocard, hailing from St. Mary’s Parish, Parel, in the Archdiocese of Changanacherry was born in the renowned Family of Thoompunkal. After his High School studies at St.Berchman’s School, he entered our Carmel Hill Monastery as an aspirant in 1935. He made his First Profession on 23rd September 1939 and the Solemn Profession on 23rd September 1942. He was ordained priest on 14th April 1946 at Thuckalay. Rev. Fr. Brocard served our Province under many titles. He was superior and prior in many of our communities. He was the Provincial Procurator at a time when the resources at our disposal were very limited and hardly sufficient. He also served our Province as a Provincial Councillor. His virtuous frugality, total dependence of God’s providence, the incomparable commitment to the responsibilities entrusted to him and the total and surrendering obedience must become source of inspiration for all of us. Dead or alive, they bring us great blessing!! While living with us they walked with us giving us life and light, after leaving us all, they intercede for us!! May he intercede for us!! Our dear Fr. Joseph Nedumpurath of St. Teresa expired on Friday, 31st January 2003 at Carmel Hill, Trivandrum at the age of 55, in the 32nd year of his religious profession and 23rd year of his priesthood. Fr. Joseph Nedumpurath was born at Arikuzha in the diocese of Kothamangalam on 23rd June 1948. After his school education and after serving as school teacher for some time he joined the Carmelite order and made his first profession on 24th April 1971 and solemn profession on 6th June 1976. After completing his philosophical and theological formation he was ordained priest on 18th May 1980. After his ordination he was assigned with various responsibilities in the province such as Director of postulants, Master of students at Philosophy College, Superior of Carmel Nivas, Ranchi and Regional vicar of St. Theresa’s Regional vicariate, Punjab. Because of his knowledge of Hindi language and aptitude for mission he was the first choice when the expansion of Carmelite life in Bihar was thought of. As a pioneer missionary he was the founder of our presence in Ranchi and for many years he continued to be in charge of the House is Ranchi. Later he was transferred to St. Theresa’s Regional Vicariate. In 2002 he was elected as the Regional Vicar of St. Theresa Regional Vicariate. As Regional Vicar he had begun to enkindle new life in the mission. But in July 2002 he was diagnosed as a Cancer patient and was admitted in the Regional Cancel Center (RCC) in Trivandrum for treatment. He has to undergo severe pain, suffering both physical and mental, but he bore everything heroically and without complaint. He came back to the monastery and his condition was steady for some time. Slowly his condition was deteriorating and by the end of January his condition became very serious. On 26th January he developed difficulty in breathing and he asked for the Sacrament of the anointing of the sick. Fr. Provincial, in the presence of the members of the community gave him the anointing of the sick at 10.00 p.m. and immediately he was taken to the hospital and was operated upon. There after he did not regain his consciousness. On Friday 31st January, 2003 at 4.30 p.m. our dear Fr. Joseph breathed his last at the RCC hospital. By 7.30 his body was brought to Carmel Hill Monastery in a mobile mortuary and was placed in the church. Having the news people of all walks of life-priest, religious and laity, had flocked to our church to pay their respect, among whom were Rt. Rev. Dr. Soosa Pakiam, Bishop of Trivandrum and His Grace Joshua Mar Ignothios, auxiliary Bishop of the Archdiocese of Trivandrum. The Community of Carmel Hill celebrated a Requiem Mass officiated by Rev. Fr. Provincial, on the next day, Saturday, 1st of February 2003 at 5 a.m and the body was taken to Lisiux Centre, Muvattupuzha, accompanied by many members of the community. At 2.00 p.m funeral Mass was celebrated at Lisieux Centre, presided by Fr. Augustine Kizhakedam, Provincial and attended by members from all our communities and Regional covariate, and relative of Fr. Joseph. At 3.30 p.m the last part of funeral services was conducted by Rt. Rev. Dr. George Punnakottil, Bishop of Kothamangalam and the mortal remains of Fr. Joseph Nedumpurath was laid to rest in the Crypt of Lisiux Centre. May he rest in peace. Fr. Joseph Nedumpurath was an ordinary, but exemplary religious with extra-ordinary quality of simplicity and availability. Unassuming, undemanding, he was happy and content with minimum. A man of prayer and deep spirituality he was very heroic and exemplary in his prayer life combined with missionary zeal. Till the last moment of his life, he was holding fast a picture of our Lord of mercy. May the merciful Lord grant him everlasting life in the company of his saints. Bro. Basil (Francis Koduveliparambil), Son of George and Thresia, was born on October 26, 1906 at Chennur in the Archdiocese of Verapoly. On November 1, 1930 at the age of 24 he joined our order as Aspirant at Carmel Hill, Trivandrum. After six months of Postulancy on April 15, 1931, he received the religious habit at Carmel Hill and made his First Profession on 17th April, 1933. He made his Solemn Profession on April 17th, 1936, at St. Elias Monastery, Thuckalay. Bro. Basil was conventual in our Monasteries at Trivandrum, Thuckalay, Varapuzha and Bangalore. Bro. Basil served our communities as Sacristan, in charge of garden, mess department and linen Department. He was very much committed to the duties entrusted to him. Bro. Basil showed great interest in teaching Catechism in Sunday school at Varapuzha and Trivandrum. In April, 1983, Bro. Basil Celebrated the Golden Jubilee of his religious profession. Bro. Basil was suffering from various ailments, due to his advanced age since two years. On December 6th 1992, he was admitted in the Jubilee Memorial Hospital at Palayam, Trivandrum, for better medical care. On Sunday, the 20th of December, 1992, at 2.30 a.m Bro. Basil slept in the Lord, after receiving the sacraments of the church. His funeral took place on the following day at 8.30 am. Fr. Provincial presided over the concelebrated funeral Mass and preached the homily. Msgr. S. Thomas, Vicar General of Trivandrum Diocese officiated at the last rites. Representatives from our various monasteries, religious and laity were present for the funeral service. The mortal remains were laid to rest in the Monastery Crypt at about 9.30 a.m.
May the Lord lead his servant to the company of Angels and Saints. Our dear Fr. Joseph Kallanthara of St. Teresa expired on Friday, 26th of December 2003, in the 13th year of his religious profession and 7th year of his Priesthood, at St. Teresa’s Monastery, Ernakulam at the age of 35. Fr. Kallanthara is hailing from Karimpany, in the Diocese of Palai. His parents are Ouseph John and Marikutty. Fr. Joseph was 4th in order among their five children. After his school study he joined the Carmelite order and made his First Profession on 8th of September 1987 and Solemn Profession on 6th of June 1993. After completing his Philosophical and Theological studies he was ordained priest on 22nd of May 1996 at Blessed Sacrament Church Karimpany by Rt. Rev. Dr. Joseph Pallickaparambil, the Bishop of Palai. Fr. Jose was a priest endowed with exceptional human and Pastoral gifts which made him acceptable wherever he served. After being ordained priest in 1996, he had to embark on a life of hectic action and prayerful ministry. He was the youngest priest in our Province to be entrusted with the construction of such a big and beautiful monastery of San Joe Ashram Potta. Neither was there any younger Provincial Procurator than Fr. Jose in our Province. It is surprising to see how much he has been doing for our Province when he was in Trivandrum as our Provincial Procurator in one triennium alone. He was the Manager of St. Joseph’s Press Buildings, Manager of Carmel Book Stall and Parish Priest of Thrikkannapuram. Along with these responsibilities he personally over saw the works of R.A.S. house constructions, different building construction of our Province, the purchase and refurbishment of Belthangady property and building at Belthangady. The sad and sudden demise of Fr. Jose occurred by an accident when he was riding a motor-bike, near Ramapuram. He was rushed to Marian Centre Hospital, Palai and form there to Caritas Hospital, Ettumanoor, where he succumbed to the serious head injuries on the following day of Christmas, 2003. Even when signs and symptoms of unhealthy attitudes in our province arose, he served as a powerful bridge-builder of unity and love. Never had he attended to his personal comfort or interest. He was very much creatively involved in faithful oriented ministry. That is the very reason why he readily accepted to be a parish priest when he was provincial procurator and the chaplain of medical trust Hospital when he was the manager of our buildings in Ernakulam. A priest with unique character, fearing none, Fr. Kallanthara was impeccably incorrupt in exercising all his responsible offices. He was bequeathed to us a life style of personal simplicity, unflagging determination and tireless work for the order and for the church. He has accomplished within this short span of 7 years, whatever anyone might do in scores of years in priesthood. May the merciful Lord grant him everlasting life in the company of his saints. Rev. Bro.Fidelis of St. Lawrence expired on August 8, 2004, in Bangalore and was buried at Carmel Hill Monastery, Trivandrum. Son of Mathew Mamoottil and Marian, M. C Varghese was born on April 7, 1914 at Puthenpeedika, in the Syro-Malankara Archdiocese of Trivandrum. In 1932, at the age of 18, he joined our Order at Carmel Hill Monastery, Trivandrum. On August 20, 1934, he made his first profession and the Solemn Profession on August 20, 1937. Bro. Fidelis served the Malabar Province under various capacities, such as tailor, shoes maker, refectorian, and infirmarian. His major service to the province was as the assistant manager of St. Joseph’s Press from 1948 to 1959 and as the manager from 1959 to 1981. During his period of office St. Joseph’s Press was brought to prestigious position it holds today. As a religious he led an exemplary life, in which prayer, silence and work harmoniously mingled. As long as his health allowed him, Bro. Fidelis has been very regular for every community act and in fact, for many years, it was he, who used to be present for the Morning Prayer in the choir before everyone else. In spite of his old age and ill-health, Bro.Fidelis spent long time every day stitching habits and mantles, making rosaries, repairing clocks etc. For many years he used to go to the Novitiate house to stitch habits for our novices. For the last two years of his life Bro.Fidelis suffered a lot. Being highly diabetic, two of his toes on the left leg were amputated and with an ulcer- affected stomach, he lived practically on liquid food. Even in the midst of pain and suffering Brother always had a smiling face and he never made a complaint about his sickness and pain. Anyone visiting Brother went back only edified by the graceful way he suffered. The community of CTC celebrated the 90th birthday of Brother on April 7,2004. As his health was deteriorating, he used to experience breathing difficulty and chest pain. On Sunday, August 8, 2004, his breathing difficulty aggravated and immediately he was taken to the nearby hospital, where he succumbed to death. As Fr. Rector and others were standing around brother Fidelis and praying for him. His holy soul flew up to heaven to rest eternally in the hands of the Almighty Father, by 11.45 a.m. On the same day at 4.00 p.m Holy mass was celebrated in the CTC Church, Bangalore, for him and his body was taken to Carmel Hill Monastery, Trivandrum. Rev. Fr. Raphael was born on 25th June 1909 in the aristocratic and ancient family of Kudakkachira. His parents were Cheriyan and Anna, Pious and devout Catholics. At baptism he was given the name Thomas. He had his primary, middle and high school education in St. Thomas High School Palai. After his graduation in St. Berchuman’s, Changanacherry with the highest mark he joined the Madras Government Medical college and passed M.B.B.S. in the Madras University. He set up private practice in a clinic rented out to him by his eldest brother -in -law Adv. C.A Mathew. Patients from different walks of life began to consult him and soon he became famous as an efficient physician at Palai. After nine months of practice he decided of follow the foot prints of his saintly eldest brother Pathachan (Fr. Philip Kudakkachira), who was the first missionary priest from Kerala sweating and foiling of the upliftment of the downtrodden and who succumbed to cholera and offered his life for the Vizag Mission. The young and energetic Dr. K.C. Thomas left of Visakapatanam to join the M.S.F.S Seminary, where he completed his minor seminary studies. He was sent his superiors for his Philosophical-Theological studies to St. Joseph’s Apostolic seminary Alwaye. That was a turning point in his life. There he came across the venerable Fr. Aurelian OCD and the servant of God Fr. Zacharias OCD. He was highly impressed by their life of prayer and austerity of life. Bro. K.C Thomas finally decided to become a Discalced Carmelite and Fr. Zacharias approved his decision. On 11th June 1945 he was vested with the holy habit of our Lady of Mt. Carmel and he was given the name Raphael of St. Joseph. After his novitiate under Fr. Lucas of child Jesus who discerned his vocation to Carmel by putting him to severe tests. He made his simple profession on 8th September 1946 on the feast of our Lady. He was Ordained priest on 25th March, 1950 in Carmel Hill Church by Bishop of Trivandrum Rt. Rev. Dr. Vincent V. Derere OCD and he offered his first Mass on 26th March. He was professor of Biology in our Philosophy College and also Bursar. He was a living example of holiness to all. He was professor in our preparatory college. He served St. Teresa’s Monastery Ernakulam, and St. Joseph’s Monastery Varapuzha and wherever he had been he was a living witness of prayer and asceticism. Towards the close of his life in 2003 December 17th he had his dark night of sense and spirit and thus he became conformed to Jesus Crucified. So much so he could say: “I live, now not I but Christ who lives in me”. His message to his brethren is, “be imitators of me as I am of Christ”. Last three years of his life he was almost bedridden. Amidst of all his suffering he welcomed everybody with smile. He was reciting Rosary continuously and even in the sleepless night. In the last three years he was suffering a lot, but there were no complaints about any thing and anybody. He slept in the Lord at 1.30 a.m. in Cosmopolitan Hospital, Trivandrum. His body was brought to Carmel Hill Church as so many people from different walks of life paid homage to him. Archbishop Soosai Pakiam offered Mass at 5.45 p.m on 17th in our church. Bishop Joseph Mar Thomas of the Archdiocese Trivandrum sang the office of the dead. His body was taken to Lisieux centre, Muvattupuzha on December 18th, 2005. After the solemn requiem Mass concelebrated by hundreds of priests and presided over by very Rev. Fr. Mathew Azhakath OCD, our Provincial. His mortal remains were interred into our cemetery at Muvattupuzha by 1.00 p.m. Bishop George Punnakottil, Bishop of Kothamangalam has come and sung office of the dead before burial. All who took part in the funeral of our Father Raphael felt that they participated in funeral of a Saint. May the Lord in his mercy grant him eternal rest. Our dear Fr. Albert Kattikaran of the Child Jesus born on 1st August, 1923 at Ernakulam, Kerala. His parents are Joseph K. Kattikaran and Claramma Thoppil. He did his novitiate in our Carmel Hill Monastery and St. Elias’ Monastery Thuckalay. He made his simple profession on 8th September, 1947. He did his Philosophy course at Carmel Hill. After a brief period or training in religious discipline he was allowed to resume his theological studies during which on 8th September, 1950 he made his solemn profession. His theological studies were at Carmel Hill. He was Ordained Priest on 24th March 1955 in Carmel Hill by the Bishop of Trivandrum Rt. Rev. Dr. Vincent V. Derere OCD. He was conventual in many of our houses, Carmel Hill, Trivandrum, Cherupushpa Ashram, Ettumanoor, Christu Raja Church, Muvattupuzha, Thridengiri Munnar, Carmelaram, Bangalore, St. Teresa’s Monastery, Ernakulam, Avilagiri Ashram, Koombara and the manager of Carmel Book Stall, Ernakulam. On 23rd may 1990, he was admitted in Nirmala Hospital, Calicut for diabetic Carbuncle. On 12th of September he was removed to Lissie Hospital, Ernakulam for a major nerve surgery for his neck to remove the compression in the spinal cord. Two days after the operation he had a heart failure. Though his condition was serious, he recovered slowly. After a stroke on 16th February, 2006 his right side is paralized and unable to speak. Then he was admitted in Cosmopolitan hospital, Trivandrum. There he got medical care in I.C.U for six days, but his health wad declining. He breathed his last at 7.00 p.m on 23rd February, 2006 at Cosmopolitan hospital, Trivandrum. His body was brought to Carmel Hill church and laid in stage for the people to pay their homage to him. So many people including priests and sisters paid their homage to him. His Grace Soosai Pakiam, Archbishop of Trivandrum said the Requiem Mass in the evening of 24th February at Carmel Hill Monastery church. Bishop Joseph Thomas, the auxiliary Bishop of Malankara archdiocese of Trivandrum sung the office of the dead. His body was taken to Lisieux centre, Muvattupuzha on 24th Night. On the way to Muvattupuzha his body was kept for some time in the Monastery Chapel of St. Teresa’s Monastery Ernakulam. By 10 o’ clock in the morning on 25th February the body reached at Lisieux centre. After the solemn Requiem Mass presided over by Rev. Fr. Provincial his mortal remains were interred into our cemetery at 1.00 p.m. Bishop George Punnakottil was kind enough to have absolution over his body. May the Lord in his mercy grant him eternal rest. Fr. Bonaventure Oppanthadathil OCD, was born on Januuary 3rd, 1920. He is the youngest son of Thomas and Mary. He had three elder brothers and an elder sister Mary married to Thomas Maniangat, Kozhuvanal. He joined our Aspirants House, Carmel Hill Monastery on 31st May 1940, after passing his SSLC and teaching in the Primary school, Maragattupally for two years . He was vested with the Holy Habit of Carmel on 7th June 1941 when he was given the name Br. Bonaventure of the Holy Trinity. He made his First Profession on 9th June, 1945. After the Philosophy course in Trivandrum, he was sent to St. Elias’ Monastery, Thuckalay for theological studies. He was ordained sub-deacon by Rt. Rev. Dr. Agniswamy S.J, Bishop of Kottar. When the novitiate was shifted to Thuckalay from Trivandrum in 1947 he joined the philosophical and theological college and was ordained a priest on 2nd April, 1949 in St. Joseph’s Cathedral Palayam, Trivandrum by Rt. Rev. Dr. Vincent V. Derere OCD, Bishop of Trivandrum. He offered his first Holy Qurbana on 3rd April 1949. He served as prior in the monasteries, Trivandrum, Thuckalay, Bangalore, Kalady and Ernakulam, Provincial Councillor and Master of Philosophy Students. He was Father-in-Charge of Mount Carmel Ashram, Palai and Lisieux Centre Muvattupuzha, finally from 1999 until his death on 8th June, 2008, he was the confessor and Spiritual Father of Lisieux Centre. Since a year he was laid up but he said Holy Mass every day in the small chapel opposite to his cell. He was waiting for the Lord’s call. On Friday 6th June 2008, after being fortified by the Anointing of the sick and Holy Viaticum he was taken to the near by Nirmala Hospital where on 8th June 8.30 am he commended his saintly soul to the Holy Trinity for whose glory alone he lived, worked and suffered. Fr. Sebastian Koodapattu, provincial, presided over the funeral Mass at 10 a.m on 9th June 2008 in which there were more than fifty concelebrants. Fr. Bernardine Vallathara OCD, who was the close friend and companion of Fr. Bonaventure from the Aspirancy to Ordination to Priesthood gave a very touching funeral oration. Mar. George Punnakottil, Bishop of Kothamangalam, who had Fr. Bonaventure as his confessor and Spiritual Father for the last six years concluded the funeral service. Fr. Bonaventure was a man of God and a gentle and helpful person, always pleasant and joyful, always available for the community and others, poor in spirit and fact. He had a good community spirit and a sense of joy. He was a devoted child of Mary, the Mother of Carmel. His Excellency Mar Sebastian Thekethecheril, Bishop of Vijayapuram, His Excellency Mar Joseph Pallickaparambil, Bishop Emeritus of Palai and His Excellency Mar Julius, Bishop of Muvattupuzha sang absolution over the body of Fr. Bonaventure who was held in high esteem by them. God grant him eternal rest. Fr. Simon, son of Mathai and Rosamma, was born on 23rd of October 1949, at Kanakkary, belonging to the Parish of Kottakkapuram in the Archdiocese of Chaganacherry. After passing his S.S.L.C exam he joined the aspirants house at St. Teresa’s Monastery, Ernakulam. He made his novitiate at St. Elias’ Monastery, Thuckaly and made his simple profession on 24th of April 1968. After his Solemn Profession on 24th of October 1974, he had his three years philosophy studies at Carmel Hill Philosophy College, Trivandrum and he took his B.A Degree from the University of Kerala. He had his theological studies in Carmelaram Theology College, Bangalore. He was ordained a priest on 28th of April 1976 at St. Mathew’s Church Kothakkupuram. He was sent to St. Joseph Apostolic Seminary, Alwaye for his licentiate which he took with distinction. He was procurator in Carmelaram Theology College for some time when he was elected provincial Councilor. He was professor of the postulants, while at Cherupushpa Ashram, Ettumanoor. He was a victim to high diabetes. In 2002 he was transferred to Carmel Hill Monastery, Trivandrum. Diabetes became incurable so much so that his right leg was amputated. Since then he was laid up, but he was very well looked after by the community and province. In 2008 January his condition became worse. So he was admitted in Jubilee Memorial Hospital, Trivandrum. Where after being fortified by Viaticum and anointing of the sick he commended his soul to the Heavenly Father on 29th June 2008 at 10.45 p.m.
His body was brought to Carmel Hill at 11.30 p.m. Our Fathers and Brothers kept vigil praying for Fr. Simon. On 30th morning his body was taken to the Church and was laid in state for the people of God to pay him homage. At 6.15 Fr. Rockose Kolenchery, Prior of Carmel Hill presided over the Solemn concelebrated Mass in the Church at 6.15 a.m. sang the absolution over him. Fr. Zacharias Varikkamackal OCD, gave the funeral oration extolling his heroic and patient suffering for the last four years of his life. At 10.30 a.m. after saying a repose over his body, he was taken to Cherupushpa Ashram, Ettumanoor where he spent a major part of his life. On 1st July his body was taken to Liseiux Centre Moovattupuzha for the funeral. The funeral service began at 10.00 a.m., Fr. John Kunnathumadappalli, cousin brother of Fr. Simon was the chief celebrant. The Mass was concelebrated by the Fathers from our communities. Fr. Justin Avanooparampil, classmate and colleague of Fr. Simon and hailing from the same parish gave the funeral oration. Rt. Rev. Mar George Punnakothil officiated at the funeral and his mortal remains were interred in the crypt by 12.30 p.m. where he lies awaiting the resurrection of the Dead. A good number of priests and religious, his relatives and lay faithful attended the funeral. Fr. Simon could rightly be called the passion flower of Malabar Province. E. C. Joseph (Ouseppachen) was born in an aristocratic family at T. V. Puram in the parish of Vaikom in the Archdiocese of Ernakulam on 26th of May 1926 of noble parents Chacko Elankuttuchira and Mariam Varappatty, Moovattupuzha, Karakunnam parish, Kothamangalam diocese. Late Fr. Jacob Elamkuttuchira alias Babychan was his eldest brother. His younger brother, only surviving member of the family is Fr. Joy retired professor of Head of the Dept of Physics in Bharata Matha College, Thrikkakkara, in the Archdiocese of Ernakulam, now living in their house which is given over to Snehagiri Sisters, Palai. His eldest sister late Mariyakutty was married to late Mr. Paulose Mundakal, Karimannor, Diocese of Kothamagalam. His younger sister Late Annkutty joined the CSN Congregation, Ernakulam, taking her name Sr. Margerat, CSN. Marriakkutty’s only son Paulose Mundacal’s son, Br. Paul Mundakal, OCD is now doing his regency at Mount Carmel Monastery, Peravoor. His fathers’ brother Joseph Elamkuttuchira was his uncle. His fathers’ only sister was married to late Chevalaic A.C.M. Anthraper. E. C. Joseph entered into our Apostolic School, St. Teresa’s Monastery in 1947. After passing S.S.L.C from St. Albert’s High School, Ernakulam, he was sent to our Novitiate at Thuckalay. His novice Master was the late V. R. Fr. Eliseus Malamakkal OCD, who was the first Indian OCD Provincial. He received the Holy Habit of Carmel on 18th March 1951 and began the novitiate taking the name Br. Anselm of St. Andrew Corsini, who was the Rector of his master Fr. Eliseus, OCD. While he was a student of our Teresianum, Rome. He made his simple profession on 19th March, 1955. While doing his Philosophy course he was sent to the province of Flanders, Belgium, our Mother Province with his companions in 1956. After the completion of his philosophical studies in Belgium he returned to India. Every religious has to undergo the Dark night in order to purify himself so that he can be united with his spouse, Christ and Him Crucified. Br. Anselm too had his Dark night when twice he had to interrupt his studies while he was doing his theology course in St. Joseph’s Apostolic Seminary Alwaye. Br. Anselm was advised to leave and go home as no one was left at home by a well wisher. He replied “I shall never leave the Carmelite OCD even if I have to remain for the whole of my life as a chorist Brother”. He was courageous to take up the cross of Christ and follow Him on the way of the Cross. At last his tearful prayers were heard and finally Br. Anselm of St. Andrew Corsini OCD was ordained a priest on 30th April 1975 at Vaikom by Mar Sebastian Mankuzhikary, Auxiliary Bishop, Archdiocese of Ernakulam. He was first declared a capitular in St. Teresa’s monastery, Ernakulam. As procurator of the house, he looked after the temporal affairs of the House without neglecting his priestly ministry in our Church and neighboring Convents irrespective of Rite and thus he brought consolation to many souls. He was a well known Charismatic preacher. From the time of his sacerdotal ordination he helped a lot of people to come up in life and today they are grateful to him. He was Superior of St. Teresa’s Monastery Ernakulam, Avila Dhyanashram, Sengulam, and Manager of our Buildings in Ernakulam. While he was Superior at Ernakulam he managed to receive funds for renovating beautifully the main Altar and the entire Church which even today remains the spiritual power house of the city and surrounding places. His body was taken to Carmel Ashram Kalady in the morning and was laid in state for people from all walks of life could see and pray for him. On the following day 5th December, 2009 after a solemn concelebrated Requiem Mass, his body was taken in procession in a decorated van to Lisieux Centre Vazhappally, Muvattupuzha and was laid in state before the main Altar of the Church. Most Ret Mar Julius, the Malankara Bishop of Muvattupuzha, Mgr Francis Alappat, the Chief Vicar General of the Diocese of Kothamangalam in the absence of the Bishop sang absolutions over him and conveyed their heart - felt condolence to our Fr. Provincial. The funeral services began sharp at 11 a.m. as announced before. Our Fr. Provincial, Very Rev. Fr. Sebastian Koodappattu OCD presided over the concelebrated Mass by more than fifty priests. In his introduction to the Mass Fr. Provincial extolled the yeomen services Fr. Anselm rendered to the province and conveyed his sincere condolence to the bereaved family members. 1. His spirit of prayer. He always had the rosary in his hands and he used to enter our Church to pray before the Tabernacle before going out and after coming back. Thus he kept himself close to our Lord’s living presence. 2. He was available for any service in our Churches and outside whenever his Superior asked for it. 3. Carmelaram theology College awes to him a debt of gratitude for his services there. After the Mass, Mar Sebastian Edayantharath, Auxiliary Bishop of Ernakulam - Angamaly and a native of Vaikom officiated at the funeral service. When the coffin was taken to bid farewell to the main Alter the choir sang “ Vidavagunnen Devalayame” his close relative burst out unable to control their sorrow. It was taken in procession to the cemetery and after the final prayers he was burried in the crypt. There our dear Father rests in peace expecting the Blessed hope and advent of the Lord as we sing on the last Sunday of Advent. Many priests, sisters belonging to various congregations and a good number of lay people had come to take part in the funeral. They laid bouquets and wreaths as a sign of their respect and love for the deceased. “Lord May he sleep in peace and wake in Your glory”. With Cardinal Newman we sing: “Farewell but not forever, brother dear! Be brave and patient on the bed of sorrow! Swiftly shall pass thy night of trial here! And I shall come and wake Thee on the morrow” (Dream of Gernontius). Monday, the 12th of July 1999, has become one of the most ominous days of shock and sorrow in the history of Malabar Province and that of St. Theresa Regional Vicariate. Our dearest Fr. Jose Nedumpurath (Jolly) died in a road accident at 12.20 pm. in Punjab on that day. He was on his way to Mount Carmel Ashram, Hoshiarpur from Mount Carmel School, Bhunga, where he was the Director and Father-in-Charge. He himself was driving his auto-rickshaw. He drove exactly nine kilometres when his vehicle was hit from the back by an unidentified car in its attempt to overtake the auto-rickshaw. He was thrown out of the vehicle and was left unattended until the Police personnel came from a village called Haryana. They took him to the Haryana Government Hospital. By this time information reached both at Bhunga and Hoshiarpur. Rev. Fr. Francis Kiliyampurackal, the Regional Vicar, Rev. Fr. Joseph Nedumpurath, Fr. Augustine Poonelil and a sister of Bhunga convent rushed to the hospital and at the suggestion of the Hospital authority and of their own wise judgement attempted to take him to a bigger hospital at Jalandhar. But hardly had they reached Hoshiarpur, Fr. Jolly, showed signs of deep pain and breathing problem. So he was taken to the nearby Civil Hospital. On reaching the hospital four doctors tried their best to help. But ALL IN VAIN. At 12.20 pm He breathed his last. On the following day, his body was taken to Delhi after Holy Mass officiated by His Excellency Rt. Rev. Dr. Symphorian Keepreth, OFM. Cap., the Bishop of Jalandhar. On 14th, the body was brought to Kerala, accompanied by Rev. Fr. Francis Kiliyampurackal, Fr. Joseph Nedumpurath, Rev. Mathew Nilappana, the Vicar General of Jalandhar Diocese, the own sister of Fr. Jolly, Sr. Daisy S.H., his aunt Sr. Anice SABS (both of them are missionaries of Punjab). Rev. Fr. Ignatius Ampatt, the Vicar Provincial and all the councilors, the Prior of Carmel Ashram, Kalady and many of our Fathers and Brothers, and a large number of relatives and friends of Fr. Jolly were in the Airport. On the way, the body was taken to our novitiate house at Kalady where office of the dead was celebrated. Then the body was taken to his home at Ayavana. At 1.30 the body was brought to our Lisieux Centre, Moovattupuzha. At 2.30 pm the Mass was celebrated, officiated by Very Rev. Msgr. Thomas Malekkudy, the Vicar General of Kothamangalam Diocese. The Funeral rite was officiated by His Excellency Rt. Rev. Dr. Hyppolitus, the former Bishop of Jammu and Kashmir. 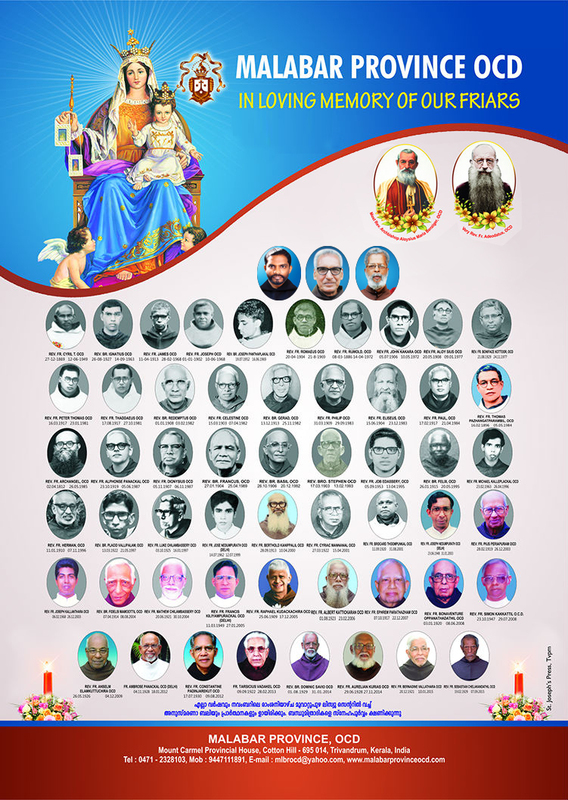 A very large number of priests, religious and hundred of relatives and Parishners of Fr. Jolly were present for the funeral rite to pay him their homage. His mortal remain were laid to rest at our newly built Crypt at Lisieux Centre, which was blessed by Very Rev. Fr. General, last year. Unlike other years, this year he has spent almost a month in Kerala, visiting almost all the religious and spending a few days each in man of our houses. It was only five days since he went back Punjab after his one month holidays. Just before leaving to Punjab after the holidays he has blessed the newly built house of his own brother in Bangalore and visited a few of his Religious friends whom he did not meet after ordination and gave them Ordination gifts. He has also made his confession in Bangalore. He was conscious unto death and received absolution from Rev. Fr. Francis Kiliyampurackal. Rev. Fr. Cyriac Mannanal of the most Sacred Heart of Jesus, gave testimony of the fidelity towards Christ and to the Gospel by his long religious and priestly life spent for the formation and education of our students, for the building up of our communities and for the various activities for bettering the spiritual and economic stability of our Province. He was born on 27th March 1922 at Mattakara, in the Archdiocese of Changanacherry, of pious and God-fearing parents, an illustrious family which gave to the Syro-Malabar church in Kerala so many priests and religious men and women who were outstanding in learning and sanctity. He has his primary education at Mattakara and his high school education was at Kidangoor. He entered the Malabar Province of the Order of Discalced Carmelites as an aspirant at Carmel Hill Monastery, Trivandrum. After the study of Latin he made his novitiate in Trivandrum under the saintly Father Lucas of the Child Jesus. He made his simple profession on 12th June 1946 and his solemn profession at Trivandrum on 12th June 1949. He successfully completed his philosophical and theological studies there itself and was ordained priest on 19th September 1953 by His Excellency Vincent V Dereère, OCD, and then Bishop of the Latin Diocese of Trivandrum. His keen intellect and mastey of Latin language with his melodious and sweet voice in Gregorian chant made the superiors to appoint him professor of Latin in our Apostolic School and later Professor of philosophy in our Philosophy College, Trivandrum. He was also Director of the Pious Union, catering to the needs of the youth. He held offices of prior of St. Teresa’s Monastery Ernakulam, superior of our mission station at Muvattupuzha, Superior of Peravoor where he built a beautiful Church, Superior of Panamaram where he constructed a Monastery and Church. The churches and Monasteries he constructed, stand as the elegant expression of artistic and architectural feats and provide alluring venue for Prayer, Eucharistic Celebration and Community life. He was superior at Potta from where he was sent to Carmel Hill. He served at our House in Muradnagar. He was the Architect and builder of our Carmel Centre, Ernakulam with a view to make the economic status of the province stable. The services of Fr. Cyriac to the Mudavanmugal Parish where he built a shrine and established as convent will be written in golden letters in the annals of Trivandrum Diocese. Due to Alsimen’s disease which towards the end, deprived him of his consciousness and was a cause of untold sufferings of body and mind. He was administrated the last Sacrament and the holy viaticum which he received consciously two months before his death from the prior of the Monastery assisted by all the Fathers and brothers. A week before his death he was taken to Jubilee Memorial Hospital, Palayam where he slept in the Lord on Easter Sunday, 15th April 2001 at 8.30 a.m., having the rare privilege of dying on the very same day Christ rose from the dead. His mortal remains were brought to Carmel Hill Monastery. People from all walks of life came to pay their respects to the dear departed “beloved of God and man”, among whom mention is to be made His Grace Cyril Mar Baselios, Arch Bishop of Trivandrum, His Excellency Soosa Pakiam, Bishop of Trivandrum. By midnight his body was taken to Lisieux Centre, Muvattupuzha. At 10.30 a.m. on the 16th April, Very Rev. Fr. Provincial officiated the solemn concelebrated requiem mass followed by the funeral rites officiated by Mar George Punnakottil, Bishop of Kothamangalam. Rev. Fr. Bernardine Vallathara, the Prior of Fr. Cyriac, gave the funeral oration. Of large number of priests, Religious and faithful including the relatives of Fr. Cyriac were present. His mortal remains were laid to rest at the cemetery at Muvattupuzha. There he awaits the glorious resurrection. Lives of great men remind us that we can also make our lives sublime and leave behind us foot prints on the sands of time. Fr. Francis Kiliyampuarackal expired on January 27, 2005, in Delhi and was buried at Mt. Carmel Ashram, Hoshiarpur on February 2. Son of Luke Kiliyampuarackal and Elikutty, Francis was born on March 11, 1949 at Athirampuzha. They were five brothers and three sisters and he was the fifth one of his parents. In 1967 he joined the Carmelite Order at Cherupushpa Ashram, Ettumanoor. He made his first profession on April 20, 1970 at St. Elias Monastery, Thackalay and the solemn profession on April 20, 1975. He was ordained priest on May 18, 1980 at St. Teresa’s Monastery, Ernakulam. He was sent to papal seminary in Pune for his M.Th. and he did his Doctorate from the Lateran University, Rome. His doctrinal Thesis was “the pastoral Vision of Archbishop Aloysius Maria Benziger”. He had his post graduation from Kerala University and B.Ed. from Annamala University. Fr. Francis had a brilliant career throughout his life. He was vocation promoter, Rector of the Regional Major seminary at Jalandhar, principal at Hoshiarpur and Una, Novice Master, twice Regional Vicar and finally the first Commissary General, bringing our Regional Vicariate to the status of General Commissariat, an independent Unit of the Order. “Zelo Zelatus sum pro Domino Deo Exercituum” the motto of Prophet Elias was literally fulfilled in his life. As a young priest he volunteered to go to African mission and he was one of the four friars chosen from different provinces to be sent to Tanzania, a new mission started under the General Definitory. But he had to return to India because of his ill health. However, his desire to be a missionary was fulfilled in the diocese of Jalandhar where he worked as a zealous missionary from 1988 till his death on January 27, 2005 except for two years he spent in Rome for his doctorate in Sacred Theology. Fr. Francis had very hectic days after becoming the Commissary General. In spite of his ill health he had to travel a lot without any interruption to our monasteries and stations spared in the states of Punjab, Himachal, Uttarpradesh, Delhi and Haryana to enquire about the well being of our brethern. On January 2 he left for Bangalore, to our Carmelaram Theology to give lectures on Grace. From there he went to St. Thomas Monastery, Ollur where he had arranged a meeting with our five deacons who would be ordained priest in the Easter week. Before returning to Hoshiarpur he visited his aged mother at Athirampuzha on Sunday 16th January. He was supposed to return to Hoshiarpur on January 18. But he was not able to travel so he postponed his journey to 22nd January. As he felt very badly, he was asked to take a flight from Cochin to New Delhi so as not to disappoint the invitees for his Sacerdotal Silver Jubilee celebrations that was arranged on 25 January at Kakkon, Hoshiarpur. Fr. Bernard was at Delhi airport to receive him. He was very tired and was taken to Jeevodaya Hospital. On examining Fr. Francis, doctors found him critically ill. Therefore he was admitted in St. Stephan’s Hospital on 23rd January 2005. He had severe breathing difficulties and was supported by ventilator until his death. The diagnoses showed that he was suffering from diabetic ketoacidosis with septicemia, acute respiratory distress syndrome and acute renal failure. On 27th January at 5.45 pm the Lord called him to his eternal bliss. Fr. Francis, always jolly, as his name indicates, worked hard, fought well, and defended the rights of position he occupied. During his tenure as Regional vicar many stations were opened, many schools were started, many convents were established, novitiate house was built at Dehra Dun, land was bought for philosophy college at Faridabad, Aspirants’ house was built at Olloor, Old age home was constructed at Nandachaur. By laying a strong foundation for the General Commissariate of Delhi and by completing the development work, to a certain extent, of the Malabar Carmelite mission in the diocese of Jalandhar he is now gone to his Lord. The funeral services were began with Holy Mass Officiated by Rt. Rev. Dr. Symphorian Keeperath, Bishop o Jalandhar and Rt. Rev. Dr. Peter Selestian, Bishop of Jammu and Kashmir at 10.30 am. More than 50 priests concelebrated for the Mass. Many religious and a good number of people paid their homage to Fr. Francis. May the Lord in his mercy grand him eternal rest. Bro. Stephen expired on 13th February, 1993, at Carmel Hill Monastery, Trivandrum at the age of 90 and in the 57th year of his religious profession. Bro. Stephen (Mani Thuruthumalil), Son of Chacko Thuruthumalil and Mary Manjooran was born on March 17, 1903, at Kaipuzha, in the Archdiocese of Changanacherry. On July 2nd, 1933, at the age of 30, he joined our order as Aspirant at Carmel Hill Monastery, Trivandrum. After six months postulancy, on February 10, 1934, he received the religious habit of our order at Carmel Hill, Trivandrum and made his First Profession on February 11, 1936. Bro. Stephen made his Solemn Profession on February 11, 1939, at Carmel Hill Monastery, Trivandrum. Bro. Stephen was conventual in our Monasteries at Trivandrum, Thuckalay, Ernakulam, Ettumanoor, Bangalore, Yercaud and Koombara. Since 1978 May, he was at Carmel Hill Monastery, Trivandrum. He served our communities in the various responsibilities assigned to him. In most of the Monasteries he was in charge of garden and cultivation. Bro. Stephen was in charge of our Carmel Book Stall at Trivandrum for few years at its beginning stage. He was very deligent in the discharge of the duties assigned to him and was always serviceable to the communities. His simple way of life, availability to the community and commitment to the duties must be a source of inspiration to all of us. In February 1986 Bro. Stephen celebrated the Golden Jubilee of his religious profession. Since two years Bro. Stephen was suffering from various ailments due to his advanced age. Many a time he was admitted in the hospital due to asthmatic complaints. Strengthened by the holy Sacraments of the church, Bro. Stephen slept in the Lord at 7.00 p.m. on Saturday, the 13th of February, 1993 at Carmel Hill, Trivandrum. And his funeral took place at 4.00 p.m on Sunday, February 14, 1993. Fr. Joseph Thuruthumalil, a relative of Bro. Stephen was the main celebrant at the funeral Mass. Fr. Francis Kunnelpurayidam, Prior of Carmel Hill Monastery preached the homily. Bishop Soosai Pakiam of Trivandrum diocese officiated at the last rites. Relatives of Bro. Stephen, representatives from our Monasteries, a good number of religious and laity were present at funeral service. The mortal remains were interred into the Monastery Crypt at 5:30 p.m.
May the Lord grant him Eternal Bliss. He was Conventual at Thuckalay, Trivandrum and Ettumanoor. In all these communities he served as sacristan and in charge of laundry. He was very diligent in discharge of his duties. His simplicity of life and devotion to work were appreciated by all. On the 4th of December 1988, he had a fall in the bath room due to a stroke, and broke one of his leg. His body was partly (One side) paralysed. He was soon taken to Cosmopolitan Hospital and subsequently to Jubilee Memorial Hospital for treatment and there he received the last sacraments. As his health condition improved, he was brought to Carmel Hill. However his condition deteriorated in the last week of April and on 25th April at 8.15 a.m., in the presence of Fr. Provincial, Prior and some students, he breathed his last. Mathai Panachikkatt was born on 1st August 1929 at Ezhalloor. His Parents were Joseph Panachikkatt and Theresia Joseph. He has 3 sisters and 3 brothers. He belongs to the St. Sebastian’s Parish Ezhallor, Kothamangalam Diocese. After the primary and secondary education he entered the novitiate and made simple Profession on 16th April 1950 at Thakala. He remained in the order as a tertiary brother. He was in our St. Joseph Press as Assistant Manager. He was one among the few who worked hard to the good name of our press. He was conventual in some of our Houses, namely Carmel Hill Monastery Trivandrum, San Jose Ashram Potta, Carmel Ashram Kalady, Lisieux Centre Muvattupuzha, etc. He was so friendly to all and was helping the people as he could. He was in our Novitiate House, Carmel Ashram Kalady during his last years. He was admitted in the San Joe Hospital Perumbavoor for one week due to fever. He was taking rest in our Novitiate House after discharged from the Hospital. On 31st January 2014 at 11 a.m. he was seen on his bed as died. He was seen peacefully sleeping as usual. The friars indentified him as he is no more. They called the doctor and the doctor recognised as silent heart attack and he breathed his last half an hour before. He was ready to the Call of His Master. It was seen that he made his confession on the eve of his death and received Holy Communion in the morning. He prepared his room and kept it clean and neat. The body was taken to the mobile mortuary and kept in our Chapel for the public. The Auxiliary Bishop of Ernakulam-Angamaly Rt. Rev. Sebastian Edayantharath officiated the first part of the funeral service held at our church. His body was taken to Lisieux Centre, Muvattupuzha on 1st February 2014 at 1.30 p.m. The funeral service began at 3.00 p.m. officiated by our Provincial Rev. Fr. Sebastian Koodappattu, assisted by many priests, in the presence of a large gathering of religious and faithful. The final rites were officiated by His Excellency Rt. Rev. Dr. George Madathikandathil, Bishop of Kothamangalam his mortal remains were interred into the cemetery at 5.30 p.m.
FR. AURELIAN KURIAS OF THE MOST HOLY SACRAMENT, OCD. Fr. Aurelian Kurias was born on 29-06-1928 at Muttuchira in the Diocese of Palai. He was the youngest of six children in the family. He had his Primary and Secondary School education at Kaduthuruthy, Kuravailangad and Mannanam respectively. Fr. Aurelian Kurias entered the novitiate of the Discalced Carmelites at Thukcaly on 24th May 1951 and made his Simple Profession on 25th May 1952 at St. Elias Monastery Thuckaly. He made his Solemn Profession on 25th May 1955 at Carmel Hill Monastery, Trivandrum. Fr. Aurelian had his Basic Philosophical study at Carmel Hill Monastery and Theological study at Ghent in Belgium where he was ordained priest on 27th July 1957. Fr. Aurelian served the Province of Malabar at different places and in various capacities. He served as Superior of St. Teresa’s Monastery, Ernakulam, Mount Carmel Ashram, Peravoor, and St. Thomas Monastery, Ollur. He was conventual at Avilagiri Ashram, Koombara, St. Joseph’s Monastery, Carmelaram, Avila Dhyanashram, Sengulam and Mount Carmel Ashram, Palai. He was sought after by many for confession and he was always readily available. He worked as a zealous missionary in Punjab and South Africa. He served the Punjab Mission, which is the Delhi Province today, as the Mission superior in its beginning years. He also served as parish priest at Muvattupuzha Latin Church in Vijayapuram Dioceses. Fr. Aurelian was a conventual of Carmel Hill Monastery during his last years since 2008. The confriars and the faithful cherish the memory of his prayerful presence in the Monastery premises, with a Rosary in his hands and a smile for everyone he met. On 19th November 2014, Fr. Aurelian was admitted in KIMS hospital with the complaint of stomach ache. The doctors diagnosed that he was having cancer in his stomach in an advanced stage. He also developed jaundice, which made his condition worse. He received the anointing of the sick on 26th from Fr. Zacharias Kariyalakulam, Prior, Carmel Hill Monastery. On 27th morning 2014, he vomited blood and became unconscious. On the same day at 9.30 pm. Fr. Aurelian Kurias breathed his last. His body was brought to Carmel Hill Monastery by 12 a.m. The community celebrated requiem Mass in the morning. Rt. Rev. Dr. Soosai Pakkiam, Archbishop of Trivandrum; Samuel Mar Ireneus, Auxiliary Bishop of Malanakara Major Archdiocese and Mar Jacob Murickan, Auxiliary Bishop of Palai paid their homage and prayed the office of the dead. His body was taken to Lisieux Centre Muvattupuzha on 26th November 2014. (According to the opinion of the doctors and experts his mortal remains were not in good condition to be kept for a long time as the result of his sickness) so the funeral service began at 6. p.m. In the absence of Rev. Fr. Provincial, who was in Europe, Fr. Augustine Valummel, Vicar Provincial, officiated the funeral service assisted by many priests. A large number of faithful including the relatives and friends of Fr. Aurelian took part in the ceremonies. The final rites were officiated by Mar George Punnakottil, Bishop Emeritus of Kothamangalam Diocese. The body of Fr. Aurelian Kurias was interred into the crypt by 7.45 p.m.
Fr. Bernadine Vallathara was born on 20/12/1921 at Mannanam in the Arch-Diocese of Changanachery. His parents were Devasia Joseph and Mariam. There were eight Children in the family. After his primary and secondary school education he entered the Pre-Novitiate on 15th April 1940 at Carmel Hill, Monastery, Trivandrum. Fr. Bernadine received the holy habit of the Discalced Carmelite Order on 7th June 1941 at Carmel Hill Monastery and made his simple profession on 9th June 1942 and Solemn Profession on 9th June 1945. He had his philosophical and theological studies at Carmel Hill Monastery, Trivandrum and Carmelite Monastery Thuckalay. He was ordained priest on 2nd April 1949 at St. Joseph’s Cathedral Palayam, by Bishop Vincent V. Derera. He served the Province of Malabar at different places and in various capacities. Fr. Bernardine was Vicar Provincial, and provincial Councillor. He served as the Prior of the Carmel Hill Monastery. And professor in Philosophy and Theology Colleges, Chaplain of the Central Prison and many convents, Director of Carmel Hill Pious Union, and Carmelite Secular Order. He also served the Province as Prefect of Studies, Master of Theology Students, Master of Second Novitiate, Chairman of RAS, and Procurator at different Monasteries. Fr. Bernardine was also the Editor of Carmel Magazine. He was a well- known retreat preacher. Fr. Bernardine has authored many books including Njan Kanda Visudhan, his memoirs on Late Archbishop Alosius Maria Benziger, with whom he had the personal experience of living together at Carmel Hill Monastery. Fr. Bernardine was very good in keeping relationships. He had many friends from all walks of life. Always devoted to the hierarchy of the church and interested in the affairs of the Church Fr. Bernardine had personal contact with many Bishops. Fr. Bernardine was a conventual at Carmel Hill Monastery during the last years of his life. He was known for his availability as confessor and spiritual father for Bishops, priests, religious and faithful. When the condition of his health grew worse due to old age and other sicknesses Fr. Bernardine was taken to the Jubilee Memorial Hospital and from there to the KIMS hospital, Trivandrum. He received the anointing of the sick, while at hospital. Fr. Bernardine breathed his last at 11 pm, on Saturday, 10. 01. 2015. The body was kept in the hospital mortuary for a day. On 11th January 2015 his body was brought to Carmel Hill Monastery. The body was kept in the Church for public to pay the last homage. At 4.p.m., the community celebrated Requiem Mass for the departed soul. A large number of people from different walks of life paid their last homage to their Spiritual Father. Moran Mor Baselius Cardinal Cleemis, Catholicos Major Archbishop of Malankara Catholic Church; Most. Rev. Soosai Pakiam, Latin Archbishop of Trivandrum; Most Rev. Vincent Samuel, Bishop of Neyyattinkara, Joshua Mar Ignatius, Bishop of Mavelikkara, Mar Joseph Perumthottam, Archbishop of Changanachery, Mar Joseph Powathil , Archbishop Emeritus of Changanachery and Mar Joseph Pallickaparambil, Bishop Emeritus of Pala paid their homage to and prayed the office of dead for Fr. Bernardine. At 1 p.m. on Monday the 12th, the body was brought to Lisieux Centre Muvattupuzha. The Funeral service started at 3.30 p.m. The Funeral Mass was officiated by Rev. Fr. Provincial and concelebrated by a good number of priests. A large number of religious sisters and faithful participated in the ceremonies. Rev. Fr. George Vettikuzhiyil, the Provincial Councillor read out the message of Cardinal Mar George Alenchery, Major Archbishop of Syro-Malabar Church. The funeral rite was officiated by Mar George Madathikandathil, Bishop of Kothamangalam assisted by Samuel Mar Irenius , Auxiliary Bishop of Malankara Major Archdiocese, Trivandrum. The body of Fr. Bernadine Vallathara was interred into the crypt by 6.30 p.m.
Fr. Sebastian Chelakandathil was born on 19/02/1929 at Thodupuzha, Thekkumbhagam in the Diocese of Kothamangalam. He was the second of nine children in the family. He had his Primary and Secondary School education at Govt. High School Thodupuzha and St. Teresa’s Apostolic School, Ernakulam respectively. He joined the per-noviciate of the Order in Carmel Hill Monastery on 7th June 1948. Fr. Sebastian entered the novitiate on 31st Oct 1949 and made the simple profession on 1st Nov. 1950 at St. Elias Monastery Thukalay and made the Solemn Profession on 1st Nov. 1953 at Carmel Hill Monastery Trivandrum. His Sacerdotal Ordination was on 11th March 1960 at Alwaye. He was a good retreat preacher and an Orator. He served in our monasteries Carmel Hill, CTC Bangalore and St. Teresa’s Ernakulam. God had his own plan about Fr. Sebastian which was difficult for us to understand fully. God purified and sanctified him through different ways. After 3 years of his Ordination he became insane. He was given treatment and care in various centers but never acquired a sound mind till his death. He was taken care by the members of Carmel Hill, CTC Bangalore and St. Teresa’s Ernakulam at various times. Last years of his life he spent in Carmel Hill Trivandrum under the loving care of confriers and philosophy brothers. On 6th Sunday September 2015, he vomited blood and was admitted to Jubilee hospital, TVM. His physical condition became worse on the next day and breathed his last on 07/09/15 at 3.05 pm. His body was taken back to CHM TVM where he was a conventual for a long period for paying the last homage. His body was kept in CHM Church and Ret. Rev. Dr. Soosa Pakiam M. Arch. Bp. of Trivandrum Arch diocese, Ret. Rev. Dr. Samuel Irenios Kattukallil Auxiliary Bp. of Trivandrum Malankara Majour Archdiocese paid their homeage and prayed the office of the dead with the faithful. On 8th Sept. after morning Mass His body was taken to Lisieux Center Muvattupuzha. At 3 pm on 8th Sept. 2015 the funeral services started at LisieuxCenter Muvattupuzha. Ret. Rev. Dr. Mathew Vaniakizhakkel, Bp. Emeritus of Satna said the office of the dead. The last Session of the funeral rites were officiated by Rt. Rev. Dr. George Madathikandathil, Bp. of Kothamangalam. The body of Fr. Sebastian was interred into the crypt by 5.30 pm. Fr. Mathew Thundathil was born in Thamarassery Diocese at Anakkampoyil parish as the youngest son of his parents Thomas and Annamma on 4th March 1966. He joined the Malabar Province of the order of discalced Carmelites on 10th June 1984. His first profession was on 8th September 1988; solemn profession on 5th June 1994; and priestly ordination on 4th January 2000. He was hospitalized in Jubilee memorial hospital in Trivandrum on 13th June 2016 for treatment in the stomach. Later he was transferred to SK hospital and then to KIMS TVM for a major surgery in the stomach on 16th June 2016 and diagnosed with cancer on 22nd June 2016. After spending a few days in Malankara hospital Piranppancode for recovery he was shifted to Velloor medical college for advanced cancer treatment and chemotherapy on 12th July 2016. After one year and three months’ treatment in velloor, he was brought back to jubilee hospital and then shifted to Rajagiri for palliative assistance in 17th October 2017. While undergoing intensive suffering, he welcomed all with a smile on his face and continued his relentless literary work without any complaint. Being sick for a prolonged period of time, he died at Rajagiri on 5th December 2017. His mortal remains were brought to Carmel Hill Monastery church on 6th December 2017 for wake during which many dignitaries from political, literary, social and religious fields payed their homage. Then on 7th December he was taken to Muvatupuzha Lisieux Center for funeral. Rev. Provincial Sebastian Koodappattu presided over for the funeral mass at 11.30 am and Cardinal Mar Cleemis the president of all India bishop conference together with Bishops Remegius, Thomas Tharayil, Joshuah and Theodosius conducted the funeral service on 7th December 2017. Fr. Mathew Thundathil served as the director of Carmel International Publishing House (CIPH) in Trivandrum of the Malabar Province from 2000 onwards. In an unparalleled manner He contributed to the Kerala Church as a visionary, writer, editor, translator, speaker, and teacher. It is his foresight and commitment that boosted up the growth of CIPH. During his tenure, he published more than 200 books. Among the countless contributions, the publication of L'Osservathore Romano, the official newspaper of the universal Catholic Church in English and malalaylam is his outstanding gift to the Kerala Catholic Church. It’s his handwork and determination that resulted the acquisition of the right for CIPH to distribute and to translate this newspaper into Malayalam which has been printed in Rome and America and been published only in seven European languages till 2009. Another unique blessing to the Indian Catholic Church is his translation of numerous apostolic exhortations, letters and documents. These church documents include the teachings of St. John Paul II, Pope Benedict, and Pope Francis. “Layam”, a heart touching novel of an integrated historical-life story of Edith stein and Teresa of Avila written by Fr. Thundathil ever remains a unique literary genre by its simple, appealing, and esthetic language use. “To see dreams and to persevere in its realization’ was his outstanding vision for life. Another feather to his literary crest is the musical presentation of the apostolic letter “God is love” of Pope Benedict in CD format. Besides these, he served the Malabar Province as Provincial councilor, Director of the social work of the province and Carmel communication, and an exemplary teacher. For long time he helped various religious convents as their spiritual father. In Brief he is an icon of simple life style and compassion. Rev. Bro. Joseph Paridyadan was born in Irinjalakuda diocese at Pariyadam parish as the Son of his parents Ouseph and Eliya on 6th June 1940. He joined the Malabar Province of the order of discalced Carmelites on 13th December 1965. His first profession was on 8th August 1968 and solemn profession on 8th August 1973. He met with a road accident at 8 am while crossing the highway at Apollo side in Chalakudy and died on the spot on 11th March 2018. The driver of the car which hit Br. Joseph took him to St. James Hospital in Chalakudy. The director of the Hospital Fr. Varghese Pathadan informed our fathers about the accident and superior of the nearby San Joe Ashram at Potta Fr. Thomas Muzuthetu together with some of his community members came to the hospital. By then Fathers from Cherupushpa Ashram and Provincial house reached the hospital and dealt with the post mortem of the Brother. After the police verifications, Brother’s body was taken to the Thaluk Hospital in Chalakudy at 2.30 for post mortem and the process was completed by 7 pm. The mortal remains were brought back to his community at Cherupushpa Ashram Ettumanoor for wake and it reached there by 9.30 pm. Fr. Paul Mundakal, the assistant superior of the community said the office of the dead and our seminarians and sisters from nearby convents participated in it. In the night Changanassery Arch Bishop Mar Joseph Perumthottam and Chief Manager of Deepika Fr. Mani Puthiyedom said the office of the dead followed by many fathers and sisters from nearby convents and seminaries. On 12th March, after the holy Mass, at 9.15 am His body was taken to Muvatupuzha Lisieux Center for funeral. Mar George Punnakottil the Bishop Emeritus of Kothmanagalam said the office of the dead followed by the fathers of our own communities and neighboring institutes and parishes. Rev. Fr. Francis Kunnelpurayidam the vicar provincial presided over for the funeral mass at 3 pm together with the concelebrants Monsignor George Kompara, [V.G. of Trissur Diocese] a relative of Brother Joseph and Fr George Edapulavan, the superior of the Churpushpa Ashram. By 5 pm Mar George Madathikandathil conducted the funeral service. Fifty-three fathers, seven OCD brothers, and about one fifty relatives of Br. Joseph participated in the Mass and funeral. Br. Joseph will be remembered for his wholehearted service to His Malabar Province as a full time sacristan and in a special way for his simple lifestyle. Our Beloved Brother Br. Antony Koikara of Bl. V. Mary OCD, 73, returned to his heavenly home on May 15, 2018 after a valiant battle with Cancer. His devotion to his Carmelite Order and his firm belief in God supported him in his struggle and ultimately gave him peace. Br. Antony Koikara was born to the late Ulahannan Koikara and Rosa Ulahannan, at Kizhakkampalam, in the Diocese of Ernakulum on November 11, 1945. He is the 5th son among 2 brothers and 4 sisters. He joined the Malabar Province of the order of discalced Carmelites on November 3, 1970 at Thuckalay. His first profession was on November 4, 1971, and solemn profession on January 23, 1977. Rev. Bro. Antony served his beloved Malabar Province as Manager to Carmel Book Stall Trivandrum, Asst. Manager to San Jose Process and as Sacristan at St. Teresa’s Monastery Ernakulum and at Carmel Hill for long time. He was a popular and passionate charismatic Retreat Preacher, healer, pastor at St. Jude Church Killipalam, and Director of Scapular Apostolate and In-charge of Third Order Members. To many communities of the Malabar Province he was a sought after member. For the last years of his life, he had been experiencing weakness due to various illnesses which disabled him from active service. In February 21, 2018, he was transferred to Mount Carmel Ashram Palai from Kalady Ashram for better climate and convenience for treatment due to his ill health and growing weakness. When in the Marian Hospital Palai for treatment he was diagnosed with Cancer, which was later confirmed by the team of Doctors of Caritas Hospital at Ettumanoor as serious beyond any medical remedies of surgery or Chemotherapy. In April 29 he was transferred to Ettumanoor Ashram for immediate care and continued treatment. He spent his final days in the Caritas hospital and in May 15, 2018, Bro. Antony Koikkara passed away at 4.35 p.m. for his eternal rest for which he was well prepared. At the time of his death, he was surrounded by many of our Friars including Fr. Francis Kunnelpurayidam, the vicar Provincial, Fr. George Edappulavan and his family members. The mortal remains were brought back to his community at Cherupushpa Ashram Ettumanoor for wake on May 16 and on the following day in May 17 after the Holy Mass in the morning his body was taken to Lisieux Center at Muvatupuzha for funeral at 11.00 am. His Excellency Mar George Madathikandathil Bishop of Kothamangalam said the office of the dead. Rev. Father Francis Kunnelpurayidam the Vicar Provincial presided over for the funeral mass at 11.00 am together with the concelebrants Fr. Abraham Mittathanickal Provincial of Delhi and two relative priests of Br. Antony Koikara. Rev Fr. George Edapplavan, the superior of the community of Bro. Antony delivered a homily during the Mass. His Excellency Mar Yoohanon Theodosius Kochuthundil conducted the funeral service during which he recalled his wonderful experience with Bro. Antony while he as at Carmel Hill. The big crowd which participated in the Mass and Funeral service consisted of 65 priests, 70 religious and 400 lay people. It was a life well lived and therefore was a precious gift to the Communities of the Malabar Province, Carmelite Order, and to the Catholic Church of Rev. Bro. Antony. "Vado parare vobis locum... ut ubi sum ego et vos sitis"